Check your PF status just in a minute. Since last 5 years, EPFO has taken giant leaps in introducing innovative services. It is benefiting both employees and employers. EPFO offers several smart facilities to check your PF balance status. You can check accuracy of latest transactions at your provident fund. Get updated on advance, transfer and settlements on your mobiles and computers. No more hassles of visiting EPFO office and dealing with forms. We have shared here different ways to check your PF status online and offline. Online facility, SMS service, EPFO mobile app and Toll Free Missed Call service are various ways. To avail these services, you should submit your EPFO account number. In some cases, member ID number too has to be submitted. If you are keen on checking your EPF balance status online with or without UAN, do refer to our post on EPF Balance. To avail the facilities provided by EPFO, employees will need some details. Like Member ID number, establishment code and extension code number. The extension code and establishment code can be obtained from your old annual slip. Refer to following different ways to check PF status and use the one most suitable to you. Now you can know your EPF balance status at any hour from anywhere. We also suggest users to get their Universal Account Number from their employer. You can activate your UAN registration at the official EPFO website with a simple process. This will help you to get tons of other facilities like member passbook, know your claim status and UAN card download. Here are different offline and online ways to check your EPF balance status. You can also go through the homepage guide. 5 best ways to know pf status online as well as through SMS is given here. Send below given message from your UAN registered mobile number to 7738299899. The above text message to the given number will give you your EPF balance amount in English. Similarly you can receive SMS in different regional languages. Change the last language code for SMS in Bengali, Gujarati, Punjabi or Tamil. Visit the page of the EPFO website at: http://www.epfindia.com/site_en/KYEPFB.php. You will need to select your state and EPFO office first. Enter your EPFO account number and mobile number. Submit these details to get your accumulated EPF amount on your mobile. If you do not have the middle three digits in your Provident Fund account number, you should leave it blank. Just enter other digits and click on submit. To avail this facility, you have to activate your UAN registration at the official website of EPFO. Use the below link to activate this registration and check your UAN status. You can grab uan number from employer in case if you are unaware. After activation, you will create your login id to check EPFO balance using UAN number. Give a missed call to the below given number and get your EPFO amount by SMS. The number is toll free and will not attract any call charges. This facility is available to employees who have registered their mobile number with universal account number. Provident fund scheme is an extremely helpful retirement scheme for all employees. These added facilities of knowing EPF balance and status offline will minimize lots of hassles. 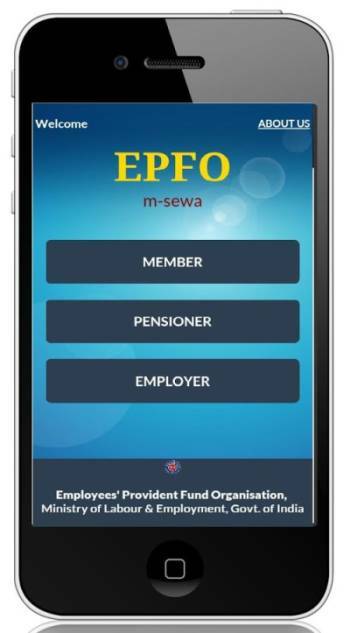 Use the link and download EPFO mobile app from google play store on your android devices. Avail all facilities of knowing PF status, EPFO claim status and PF balance enquiry with EPFO app on your smartphones. The Mobile EPF app will let you enjoy all facilities related to EPFO claim and pf status free of cost. The EPF Pensioners can see their pension disbursement. Besides above facilities, EPFO also gives members freedom of downloading e-passbook in pdf format. The passbook will give you monthly statements including employer’s and employee’s share and pension contribution. Members can download this passbook at the UAN page of the Employees Provident Fund Organization. Our site is dedicated to help all EPFO members. We have tried our best to provide all information that will help pensioners and employees to know their PF status and balance, epf claim status and other details. 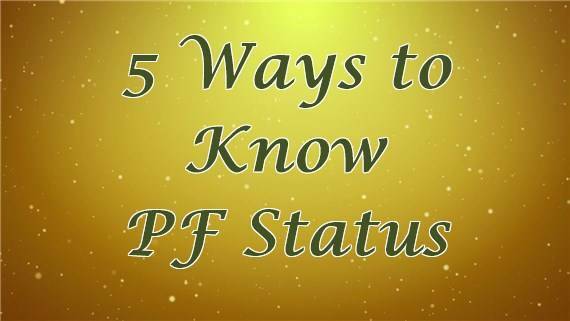 Share our information related to PF status with your friends and relatives. Get updated on tons of online and offline EPFO facilities at our site. My pf claim is under the process. How to know my claim process. I have send an SMS to th above mentioned number with UAN number but i haven;t received rely regd my PF Balance. Plg guide me. I have submeted Pf forms in PF office ( Barkatpura Hyderabad ) But Iam not get PF Amount so kindly suggest. I do not know anything about my epf. but my pf is deducted every month from my salary. How to get the details of pf no. &etc. i have pf no and uan no ..but dont know which mobile no. is registered…please suggest me how to check pf balance. My PF withdrawal is in progress since past 4 months, how will i know the status. please can you send that details on my email id . My of claim is under the process..now i want to my epfo account deatils pf no is MH/46430/180941…plz can you send pf deatils on my email id.. I need to withdraw my pf amt,but I am not finding the details.Kindly do the needful. My PF withdrawal is in progress since past 7 months, how will i know the status. PLS SEND MY UAN NO. I Sending you all pf form and document sending your mailing address,If you received my documents if yes forward it,i put my UAN number on way portal it so nil.Please look into this matter. how can check my pf. Any idea plz explain. Uan kaha milga. Plz check me pf account balance . I want to check my PF Status please sir PF No – 418516.Plz sent my mail id. i check my pf balans but it swoing. how to cheaq pf detail.